Professor Gary Rubloff (joint, Department of Materials Science and Engineering [MSE] and Institute for Systems Research [ISR]) is the co-author of a major report on mesoscale science commissioned by the U.S. Department of Energy's (DOE) Basic Energy Sciences (BES) Program. Rubloff, the director of the Maryland NanoCenter, was tapped to serve on the subcommittee that produced the report by John Hemminger, chair of the DOE's Basic Energy Sciences Advisory Committee (BESAC). The DOE's BES Program supports fundamental energy research that develops new technologies and helps fulfill the DOE's missions in the areas of energy, the environment, and national security. The program also operates major research facilities designed to serve the needs of scientists from academia, national laboratories, and other institutions. For the past ten years, the BES program has published its results in the Basic Research Needs Report Series. Produced by BESAC, which recruits contributors from energy research programs around the world, the reports have outlined the development status of alternative energy technologies and the scientific bottlenecks preventing their implementation. "The BES reports have laid the foundation for many of the major investments the DOE's Office of Science has made," says Rubloff. "Particularly notable is the $100 million investment in the nation's 46 Energy Frontier Research Centers (EFRC), including NEES, which is based at the University of Maryland." 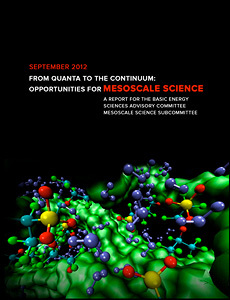 The report to which Rubloff contributed, "From Quanta to the Continuum: Opportunities for Mesoscale Science," identified challenges in and refined the definition of the field of mesoscale science, which is generally understood to cover structures and devices that fall somewhere between the nano- and microscales. But, says Rubloff, "meso" is much more than length scale. "The report recognizes qualitative distinctions in the arrangements of small things, such as atoms, situated somewhere between the 'top down' way we make things like semiconductors—using instruments in clean rooms—and exploitation of the 'bottom up' fabrication that occurs in nature, like self-organizing DNA or the self-assembly of nanoparticles into regular arrays. Meso is the new science that happens when smaller objects we understand or research are brought together as larger populations." The report identified six "priority research directions" for mesoscale science, including mastering defects; regulating coupled reactions; optimizing transport and response properties; understanding non-equilibrium and many-body physics of electrons; harnessing fluctuations, dynamics, and degradation in order to control mesoscale systems; and directed assembly of hierarchical functional materials. Rubloff was particularly involved in defining the research directions concerning defects and directed assembly, two areas in which both he and many of his colleagues at the Clark School are active. "For example, at NEES, we make multicomponent nanowire structures for use in batteries and capacitors," he says. "The directed assembly of billions of these close together is a major challenge." Other examples Rubloff cites include the multiferroic materials systems created MSE professors Ichiro Takeuchi and Manfred Wuttig; block copolymer ordering studied by MSE professor and chair Robert M. Briber and Fischell Department of Bioengineering (BioE) professor Peter Kofinas; the study of defects chemistry in solid state ionics by University of Maryland Energy Research Center director Eric Wachsman; connected porous material architectures created by MSE assistant professor Liangbing Hu; cell signaling studies by BioE professor and chair William E. Bentley; and the hierarchical bio-based battery architectures designed by ISR director Reza Ghodssi. "Working on the report was a great experience," says Rubloff. "Besides the new research opportunities mesoscale science represents, I personally believe its societal impact is even greater. We've made large and worthwhile investments in nano, but translating them into economic value requires that we be able to assemble, aggregate and design nanoscale components on a massive scale. In this sense the value of nano will be delivered in large part through science and engineering at the meso scale."